The stylish and portable imageFORMULA P-215II has convenient USB power and plug-and-scan capabilities to deliver high-resolution outputs in black & white, grayscale or colour up to 600dpi for great scans on the go. With its impeccable one-pass duplex scanning feature, the imageFORMULA P-215II can scan documents front and back simultaneously in a swift 15 pages per minute or 30 images per minute for black & white documents and quick 10 pages per minute or 20 images per minute for colour – it's all the capabilities of a sizeable scanner in one portable handheld device. Measuring a mere 285 x 95 x 40mm inches when closed, this document scanner is mobile enough to carry in one hand, yet big enough to handle up to A4-size documents. 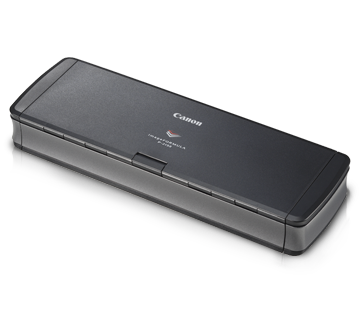 With a front-facing card slot on the imageFORMULA P-215II, users can simply scan both plastic or embossed cards. Users are able to scan to Cloud applications such as Evernote, Google Docs™ or Microsoft SharePoint™ with plug-in function. The imageFORMULA P-215II boasts hassle-free plug-and-scan capabilities and does not require any driver or application installation on both Windows and Mac OS. Upon connection, Canon's CaptureOn Touch Lite application instructions will automatically appear on screen to guide users through quick and easy steps to convert documents into electronic files, making it easy for everyone to achieve great-looking documents.